First to post here? Alright! Wo0t! Wow! Apparently hard work did pay off there, ded. I love it! Thanks for sharing this splendid wallie! wow...the bg is really great!! itz worth it u spent so much time on this wall!! the scan n bg make a sweet wall!! nice looking wall. very cute and cheerful, looks great. good job, keep it up. 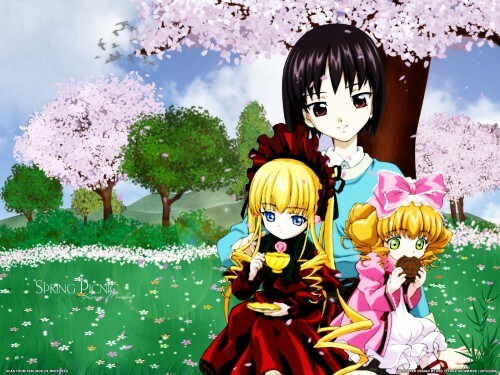 ooh rozen maiden!! love it lol.. all the rozen maiden dolls..
Really nice work on the bg ^^ The only problem is that it's winter over here, and i really can't imagine spring anymore o_O Heh..anyways, really nice work on the bg, espically the trees and the grass. Really sweet work :D !! its a lovely setting, although im not much of a fan. great trees especially! keep up the good work! Ded, did I ever mention that your an inspiration to alot of people? Well you are. Your a HUGE one to me simply because of showing me your determination to spend 45 min- per tree .....Thats insane...to be honest I love that kind of dedication. Its something to be marveled and something people should strive for. Hooray for Shinta's brushes =D *Cheers* lol....sorry anyways you did an amazing job....this is what I love about your work...the amount of detail and effort you put into your work. You never dissapoint me and I always review your work with a smile because it brightens my day to see a new submission from you. I have to say that I love the enviroment you've created in this scenery. Its gorgeous and lush. Not only that but I have to say that the scan chose (btw, I've become quite fond of the series myself) was.....as you said....perfect for a wall, its so deserving of attention and what better way to show it then through your work. Well I'll stop blabbering on about how good you are and sum it up, a perfect scenery with an amazing scan earns my favorite. Rozen Maiden wallpaper! XD yesssss! I thought I'd never find any, and this one almost got by me: viva la search function! Nice job on the wall. White seems a little blown out, but that's typical for Rozen Maiden Art. I love the trees and the flowers in the grass. Really nice work on the bg ^^ The only problem is that it's winter over here, and i really can't imagine spring anymore o_O Heh..anyways, really nice work on the bg, espically the trees and the grass. Really sweet work !! Really great wallpaper!I love the BG and the characters real well!Great work you did there,and thanks for your hard effort. It is wonderful. It is very beautiful.